Looking for some Kawasaki ZX12 fairings? We've got 'em. Whether you're looking for street or competition stuff, we make it. We even make a hi-flow duct assembly to get some more ponies out of your motor. This is a replacement upper fairing with the headlight holes filled in. This is used by a lot of street shoot out guys or street bike racers; it will take a lot of weight off of the front of the bike by removing the headlights. A lot of racers will just put a projector beam up in the front and then airbrush the shape of the original headlights and save a lot of weight on the bike. So whether you’re drag racing your Kawasaki ZX12 or want to take some weight off of it this piece here will defiantly help you out. Those side panels on the Kawasaki ZX12 are big: therefore they are pretty heavy. 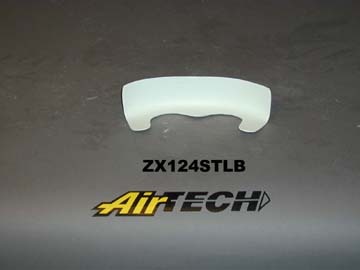 This lightweight fiberglass piece will defiantly help knock some weight off of your Kawasaki ZX12. Simply drill out the mounting holes and mount to your existing brackets and hardware. A little bit of fabrication will need to be done in the front to mount the radiator shroud, but if you’re a crafty guy who wants to save some weight on his bike or save some money you should be able to figure it out pretty quick. Get your lightweight replacement pieces today! What we have here is real cool race tail for the Kawasaki ZX12. This is the tail section with the solo seat cowl molded into it as a one-piece unit. The front seat pan area is open to use your upholstery as are the tail lights are open in the back for all of you street guys. Race legal tail section for most racing organizations or a cool race tail for a custom street bike. Call us for yours today! This tail is stretched 6 inches and will work with the upholstery. You can cut out the taillight and use our taillight bracket below to mount the light in the back of the tail. This tail is stretched 6 inches for use on the strip. Use some 5-min epoxy to mount this bracket in the back of our stretched tails and mount your taillight. The front fender for your kawasaki ZX12 is pretty heavy on the other hand our fiberglass replacement piece is pretty light. Your suspension will react faster and will have better control with our lightweight fender on it. This piece is also available in carbon fiber. Give our sales reps a call today! 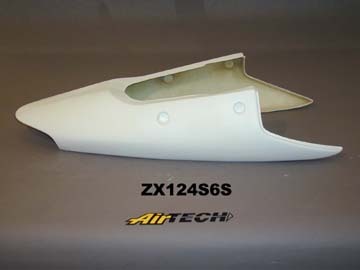 This lightweight fiberglass tank shell is a replacement for your heavy plastic Kawasaki ZX12 unit. Simply drill the mounting holes and mount it onto your chassis to save some weight on your bike. This is our high flow racing air duct assembly for the Kawasaki ZX12. This duct assembly is molded as a one-piece unit and all of the kinks, dips, and valleys have been smoothed out for much smoother, high volume airflow into your pressurized air box. 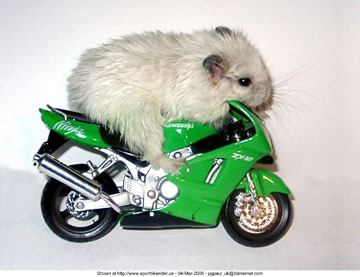 A must have if you are racing the Kawasaki ZX12.